Ford Transit-150 which has a rear wheel drive. Señor Tránsito - A Total Loss! I just got off the phone with Matt, an estimator with Progressive Insurance. Matt informed me that Tránsito's left frame rail had buckled from the collision. From the front of the rail all the way back to the dash board! This means that poor Señor Tránsito is a total loss! Vaya con Dios, Señor Tránsito! Me ha gustado conocerte. We have gone to U-Haul to return the GMC Pickup that we have been using as our tow vehicle. We will rent a U-Haul GMC 10' Box Van which will do the job of a tow vehicle and also be a storage container for everything that was carried by Señor Tránsito. After breakfast, we are returning to RBP Auto Collision Center. It's necessary to remove everything that is in inside Tránsito. Also, disassemble the Yingli solar panel and its mount. Everything will be placed in the GMC U-Haul 10' Box Van. The Box Van will be used as our tow vehicle and for storage of everything that was carried by Señor Tránsito. The only thing that I have a question about, is how to remove the Pioneer radio? The beginning of the move from Señor Tránsito to the U-Haul box van. Nearly everything has now been removed out of Señor Tránsito. All that remains to move is Tránsito's two storage shelf units, the trailer hitch and the Pioneer radio. RBP Collision has assigned one of their people to help me. His name is Erin, and he has already removed the Yingli solar panel. Next Erin is going to remove Tránsito's two shelf/drawer storage units. This how it looked at my 3 pm lunch break. I just returned to Scampy. This evening, I went out for supper with my friend Rowena. We went to a Taco Time. After supper, we returned to Scampy and I opened the U-Haul Box Van so that she could see all of my stuff inside. When you look at the pic below, you will see that I've installed both of the shelf units from Scampy into the Box Van. This allows me to put away things into these shelf units in the same place that those things were located in Scampy! having the shelf units installed is so great! And all of you are a fantastic resource for me! George, do you still have the items which were there when you purchased old Transito and you replaced those items with the Pioneer Radio? I think you know where I'm going here--just take the Pioneer Radio and put back the items where they were when you bought old Transito. The direction of my Blog story has been changing fast lately. It may be hard to keep up with what is now going on. Tránsito was declared a total loss by Progressive Insurance. Because of that, I do not have to be concerned about restoring the dash to original conditon after the Pioneer radio is removed. That tailgate is sooooo heavy. I was barely able to lift it! No way would it come all the way down, because it rested on the top of Scampy's hitch jack. I am taking your advice about considering looking at vehicles that are being sold by companies such as Enterprise Rent-A-Car. You don't suppose another self steak dinner is on the agenda do you??? A self steak dinner? I wonder what that could be? Hi George.... I agree with Mr. Ed re an off lease or a vehicle being sold by Enterprise -- the rental people. My suggestion is one of the three or four smaller trucks, either all wheel drive or four wheel drive, crew cab style, bed size your choice. Then consider a top to cover the bed --- higher near the back than the cab, and suitable for your solar panels. You can have lockable shelving along the sides of the cap for storage. These side storage areas are really handy for your most needed stuff. In mine I added a shelf inside level with the side rails and the interior of the side storage boxes. I store stuff in the bottom of the truck bed in sturdy plastic bins. Key: I have a 6 ft length of 2 x 2 with a "hook" in one end. The hook is like the hooks used to hang a bike wheel from a garage rafter. As a result, I never have to climb up into my truck.... just hook the bins and move them around. Agree with Mr. Ed too re the tail gate. Also a need to check clearance for Scampy... may want an extended connector...makes backing up easier. Just some ideas. I know you will make the best decision for yourself. The direction of my search for my next vehicle is changing so fast, it may be hard for my Readers to follow! Everything from Señor Tránsito, including the roof mounted solar panel, is now in a U-Haul 10' box truck! A 4Runner by Toyota is my new recommendation. The Rav4 is FWD. Please take your time deciding, so that you can buy this new vehicle with all your needs considered. Looking forward to seeing what you will get to provide you the storage and access you require! Your comment has wise advice for me. George, if you Are taking a look at the Ford 150 Cargo Van, it does have three different engines to choose from--1) 3.5 liter Ecoboost engine (which sips gas); 2) the V-6 standard engine (which gulps gas); and 3) the Ford Diesel engine (diesel fuel is very expensive at the pump, but the diesel engine lives forever with expensive routine maintenance). I am going to look at a Ford 250 Cargo Van this morning. It's up for sale from a nearby U-Haul. George, U-Haul is clearing out their 2017 cargo vans -my guess is they weren't popular enough for them to keep. 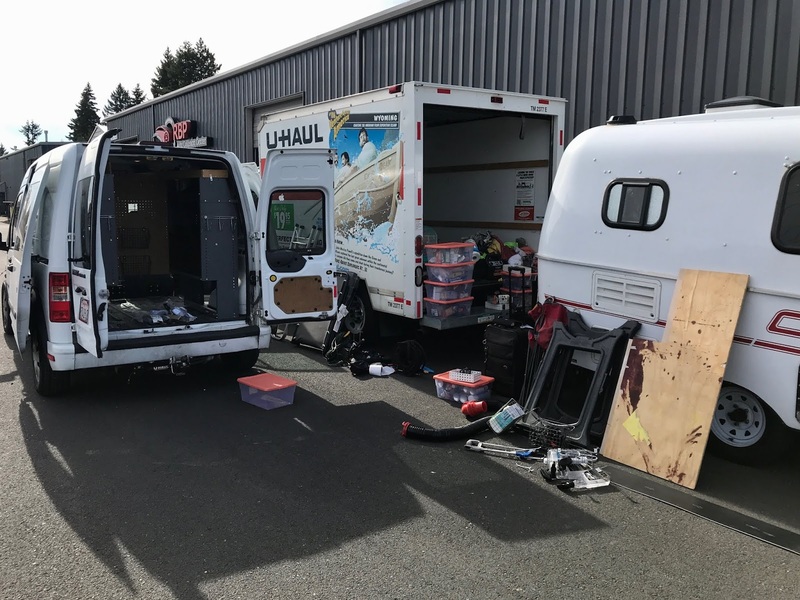 Anyway, U-Haul in Milwaukie (near you) has a 2017 Ford Transit 150 cargo van with 6,900 miles on it for $22,000. This would be a heck of a buy if it checks out. This vehicle appears to be a Ford Transit 250. I am going to see it this truck first thing tomorrow morning! I just followed your link/URL. It looks like that might be a Ford Transit 150. This morning, I went to look at the Ford Transit 250. Somebody bought the 250 yesterday. Is there a vehicle that has the storage room of a 10 foot box truck, but whose height not so damn tall? Dodge Ram ProMaster. MPG: 15. I have not published my Blog yet this morning. But when I do, it may be a shocker! 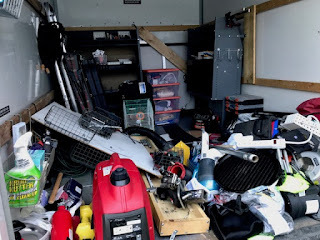 Yesterday when I was loading all the stuff from Señor Tránsito into the U-Haul 10-foot long box truck, it occurred to me that I may love doing a project that turns that box truck into a toy-hauler RV. But! If I took-on such a project as this, It would have to be with a truck that was NOT so damn high! This morning when I went to drive the U-Haul box van, I found out that it is only 9' high! That is not high at all! I've just Blogged about what my future RV will be. Hi George—I have been feeling you pain as your life transitions. If you are considering the Sprinter van, I have a friend who bought a used, older one and is building it out himself to be a self-contained RV. With your love of “putzing”, perhaps that might work for you. I know you love Scampy, but having a self-contained house on wheels might just meet your needs as you to continue gathering the years? You feel like an old friend who I talk to everyday and I truly enjoying following your adventures. Stay well my friend and remember to breathe—all will be well. You have been feeling pain? Why? Weird! I just published my Blog. And I wrote about the same thing that you commented! Take a look at my October 5th Blog! Any idea what this will do to your insurance rates? Was there a police report? Did it identift fault? Likely my insurance rates will go up. But not all at once. Little by little. Over years. It has been my experience that insurance rates track the insured driving record. Yes, the police came to the scene of the accident. The police report stated that I hit the rear of a truck. Actually, that truck crossed over the median line and struck the front of my vehicle. Then the truck lost control and hit a 3rd vehicle. Hi George, it seems to me you have struggled a bit ever since you started pulling a trailer. Maybe it's time to get back to one vehicle...so much simpler....small Class C or a camper van. Wish the best to you. I just now published my Blog. The post was exactly about that topic! What if I got back to one vehicle?